Jumperkits, LLC. Zippered nylon pouch for your Jumperkits. A rugged nylon bag that will hold up well even when tossed into your tool box! This great bag will help protect the Jumperkit wires from loss or damage. Use with or without the original plastic bag. 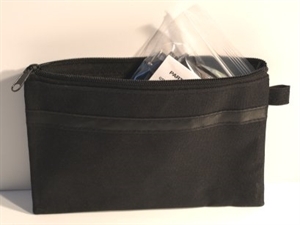 Comfortably holds 3 or 4 kits, or use the additional room in the pouch for other test leads / tools you may want to store together with the Jumperkit.